As any dog owner will know, one of the most crucial aspects of owning a dog is making sure that they always have fresh water available to them. Just like humans, dogs need to stay hydrated, both at home, and when they’re out and about. Whilst keeping fresh water on hand at home is a breeze, ensuring the same can be said during long walks or trips to the dog park/beach is not as simple. One product designed to combat this problem, and keep your dog hydrated no matter the situation, is the dog water bottle. These handy devices are specially designed for dog hydration on the go. Check out our comprehensive buying guide, and top 7 picks for the perfect water bottle for your beloved dog. Compact, practical, and stylish, the AutoDogMug from Highwave is a fantastic choice for an easy and simple way to keep your dog hydrated. 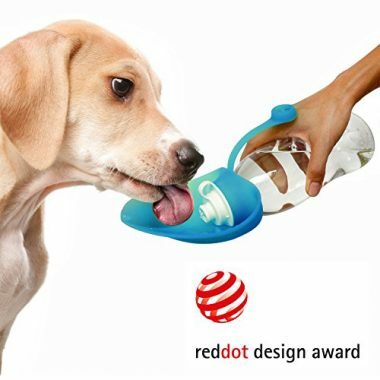 The unique design is great for conserving water that your pet doesn’t want to drink. Just a quick one-handed squeeze will release water into the upper attached bowl-lid, and when you release the pressure, the water will simply return to the bottle. Alternatively, if the water becomes dirty, then you can pour it away, and prevent the contamination reaching the rest of the water. The design is simple but attractive, with 3 colors available, and a handy removable Velcro strap that can be used to attach the bottle to rucksacks, or even belts for optimum convenience. The dog water bottle is BPA free and food safe, so you don’t need to worry about the safety of your dog. For a convenient water bottle, this is a prime product choice with an excellent 20 oz capacity. 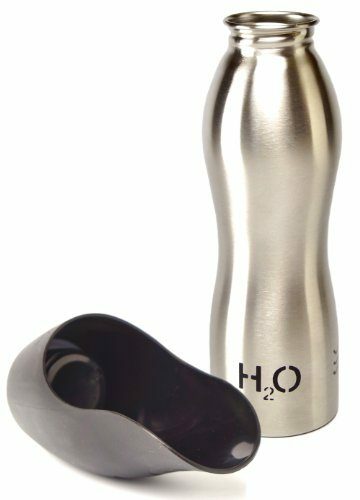 The sleek and stylish design of the H2O4K9 Dog Water Bottle and Travel Bowl is incredibly attractive with an impressive 25 oz capacity. Both the plastic twist top and food-grade stainless steel bottle are well-designed, and incredibly durable. The strength of the bottle design, with handy clip loop at the top, means that the water bottle is designed to last. Whether you’re spending the day at the beach with your dog, or on a hike, the durable design won’t let you down. The concept of the bottle is also highly practical, with the twist top taking the form of a handy bowl-like shape that allows for easy pouring both out of and in to the bottle. 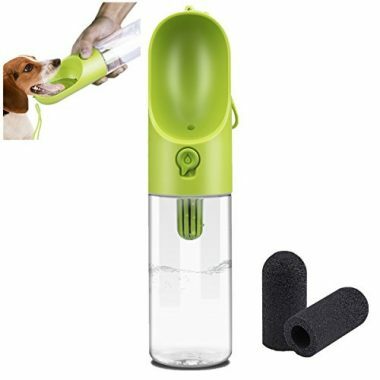 It is also a fantastic shape for easy drinking, allowing your dog to get its fill without wasting any water. The bottle recyclable and is perfectly safe for dogs with a BPA-free lid. Designed by H2O4K9, this excellent water bottle is perfect for active households who need a durable dog water bottle that will last for years to come. 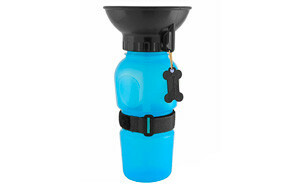 The Gulpy Jr. Water Dispenser is one of the smallest dog water bottles to make our list, with a capacity of 10 oz. Whilst smaller than many of the other dog water bottles, its compact design makes it a wonderful choice for smaller breeds of dog or for easy carrying on short walks. The overall design is very minimal, with an easy to use function that turns the attached plastic flap on the lid into a durable and well-designed dog bowl. There are some fantastic features of the Gulpy Jr. Water Dispenser that make it a prime choice, from the included belt clip, to the ability to use the unique lid design with most standard types of water bottle. It is easy to store, lightweight, and comes in multiple colors. For a smaller dog water bottle that is more than capable of keeping small dogs hydrated whilst out and about, it is a winning choice. Similar in style and use as the Gulpy Jr, the Travel Water Bottle from ANPETBEST features a fantastic function where the lid forms a handy drinking bowl for your dog. With just a flip of the lid, the leak-proof bottle converts into an easy to use bowl that is suitable for dogs, cats, and other small animals. The 11 oz design is suitable for most days out with smaller dogs, or as a bottle to take on walks with larger dogs. The lightweight design of the ANPETBEST Travel Water Bottle makes it ideal for traveling. It is very easy to clean and comes with a great fabric loop attached for carrying it around. 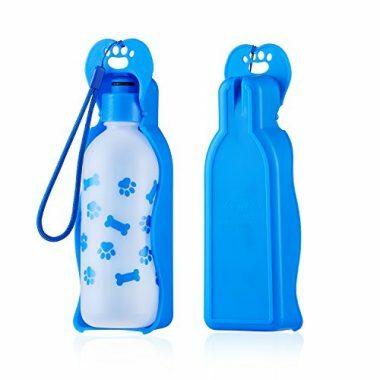 The vibrant bright blue design, with added paw prints and bones, is fun and appealing, making it a truly standout water bottle. BPA-free and safe for use by dogs and small animals, it is a practical and simple to use water bottle for all manner of activities. The Portable Small Dog Water Bottle by XUANR is a high-tech water bottle option for your pet, featuring innovative designing with exceptional water-proofing and safety measures. The main unique feature of this wonderful dog water bottle is the carbon filtering, of which two filters are included. The filters ensure that the water is perfect for your dog, but the high-tech design doesn’t stop there. The water bottle features an excellent coconut shell bowl design, which forms the lid of the bottle. With a quick press of the central button, you can release water into the easy to drink from bowl, giving you complete control over the water use. With the button locking mechanism, the bottle is also completely leak-proof, for a peace of mind over transporting the bottle in rucksacks or bags. For easy transportation, the bottle also comes with an attached sling rope. The sleek and minimalistic design looks attractive, with the fantastic function of the bottle making it a top choice for safety and practicality. With antibacterial materials used in the lid/water bowl, you can have a peace of mind over the quality of water your dog is receiving. Designed by Tuff Pupper, this larger capacity flip water bottle with attached lid is great for large dogs or long days out, with an impressive 20 oz water capacity. 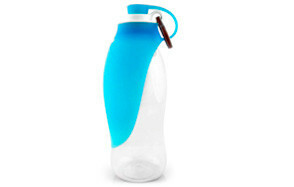 The water bottle is constructed to a high safety standard, being BPA and lead free, and FDA approved. 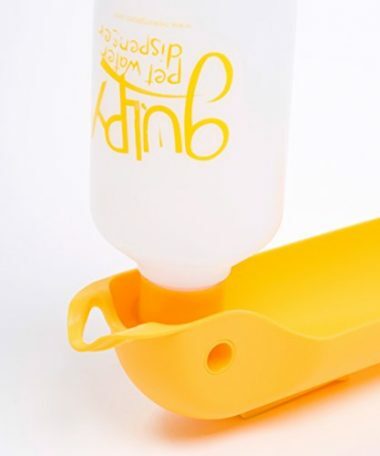 The lid and bowl design can be attached to different bottles if the included bottle is being cleaned, so it is very adaptable if you find yourself using the bottle every day. Similar in design to a classic sports bottle, with a sports cap design, the water bottle is easy to clean, practical to travel with, and very long-lasting. The silicone construction is strong, and the easy flip water bottle design makes hydrating your dog easy. There is also the excellent benefit of convenience, with the bottle being leak-proof for safe travel. A fantastically versatile choice for dog owners that need a strong and practical bottle to use every day. When it comes to ultimate hydration capabilities, few dog water bottles can compete with the Top Fill Dog Bottle from Lixit. One of the biggest things that sets this water bottle apart is the capacity of the bottle, an outstanding 44 oz. Almost double most other water bottles, the Top Fill Dog Bottle has a very versatile set of uses, with a unique water delivery system and highly practical no-drip design. The unique design of the bottle, with two flat sides and mounting positions, means that it can be easily and effectively attached to most styles of dog crate, either on the inside or the outside. This gives you the ability to keep your dog hydrated whilst in a crate without putting a water bowl inside, something that can potentially be very messy. With the ball tip nozzle, your dog can drink its fill easily without any worries over spillages or leakages, preserving water and keeping your dog crate clean and dry. While ideal for dog crate use, there is no reason why the Top Fill Dog Bottle can’t be used as an everyday dog water bottle, capable of keeping multiple dogs, or very large dogs, completely hydrated. A hydrated dog is a happy and healthy dog. When you’re out and about with your dog, fresh water isn’t always easy to come by, and its very easy to forget that most dogs don’t want to wait until they get home to have a good drink. This is why having a dedicated water bottle for your dog is so important. With a dedicated water bottle, you’ll remember to take water with you whenever you go out and make the drinking experience much easier for your four-legged friend. While some dogs will drink from almost anywhere, others prefer the convenience and ease of drinking from a bowl or water fountain. The attached systems that come with most dog water bottles make it very pleasant for your dog to drink. It’s also handy to have a good quality water bottle for the assurance that your dog is consuming safe water. Many products come with devices to ensure the water is safe and are sometimes recyclable. This means that you waste less water and ensure that there are no contaminants, either in the water or on the bottle itself. There is plenty of variance amongst the top water bottles for dogs, which while great for product choice, can make it much harder to choose the right one for your pooch. When choosing a dog water bottle, there are five big things that you should keep in mind; capacity, portability, durability, safety, and design. Capacity – There is little point carrying around a heavy water bottle that is far too big for your dog, or one that is far too small. Getting the right capacity is key to making sure the bottle is going to fit your needs and your dogs. Multiple dogs will need a much larger capacity bottle, while small dogs will only need a little water. Bear in mind the duration the water bottle will be used for when selecting the right one for you. 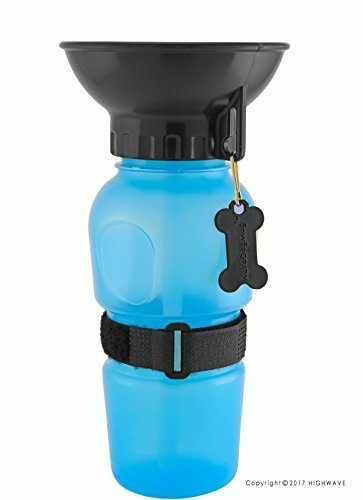 Portability – The best dog water bottles should be very portable, after all, you may be carrying them around or relying on them for hours at a time. A good portable water bottle should be leak-free, or close to, have a strap or attachment for easy carrying, and fit in most standard-sized cup holders. Durability – A poor-quality water bottle that will let you down after a few weeks or months is certainly not ideal. The bottle material and attachments should be strong and built to last, especially since they’ll be used by your dog on a regular basis. Always look for hard-wearing or flexible materials that can deal with the wear and tear of regular use. Safety – As your dog will be drinking from the bottle, it needs to be pet-safe. A good bottle should be made from approved materials that are safe for your dog to consume water from. Cleanliness is also a key point in safety, little nooks where germs can fester will not only make the bottle difficult to clean but potentially put your dog at risk. Design – The design plays a part in each of the key elements that make up a good water bottle, but also for the practicality of the bottle and how willing your dog is to drink from it. If the bowl or nozzle is the wrong size or shape, you dog may not enjoy drinking from it. Similarly, the water bottle should be easy for you to use. If you have multiple dogs that you need to keep hydrated, a bottle that gives you control over water release, or one where the water can be retracted, can be very beneficial. How to Clean a Dog Water Bottle? The cleaning regime of your dog water bottle will all depend on the type of water bottle it is, the additional attachments, materials, and the size of the water bottle. For most pet water bottles, there are three main parts that will need cleaning; the exterior, interior, and attachments. Water Bottle Exterior – The exterior is the easiest to clean. Normally just a mix of warm water and soap will do the trick when removing dirt, grime, or water stains. 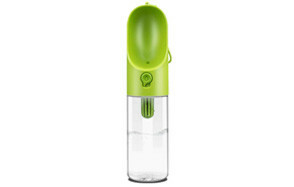 Water Bottle Interior – When cleaning the interior, it is important to make sure that you get to all the little nooks at the bottom of the bottle. Using a bottle brush can be of great help when reaching the very bottom and ensuring a deep clean. Soap and water will normally suffice, although a very small amount of disinfectant can be used as long as it is completely removed. Attachments – All attachments should be cleaned separately, and you need to make sure that you clean all the nooks. Depending on the type of attachment and the material, this could be very quick or a lot more intense. If the bottle has a tube, then it is essential to clean the grime that can build-up inside. A dehydrated dog can very quickly become an ill dog, something that no dog owner wants for their beloved pet. The risk of dehydration grows when your dog is outside and being active, such as on hikes, walks, or at the beach, especially when it’s hot outside. Dehydrated dogs may lose their appetites, get dry gums, lose the elasticity in their skin, have sunken eyes, or even suffer from depression. If you dog doesn’t drink enough water, it also won’t get the nutrients it needs to stay healthy; it may have trouble digesting food, and it won’t be able to properly cool down –which can be incredibly dangerous. From problems with their joints, to organ damage from sustained dehydration, there are countless vital reasons why your dog should have constant access to clean and fresh water, no matter where they are or what they’re doing.